The trend of using past Pollard demos and re-recording them with the full band continues with this EP. Both Pluto is Polluted and Aquarium Hovercraft appear on Suitcase 3 in what sounds like Pollard by himself with a guitar, and even singing the solo part on Aquarium Hovercraft. Both are recorded with the Boston Spaceships here and are generally full band versions that are true to the versions of Suitcase 3. During the chorus to Pluto is Polluted, I am somewhat reminded of The Doors. Aquarium Hovercraft is made up of three distinct parts; the first has Pollard ripping through the lyrics at a hectic pace, the second slows the song down to a grooving pace, and finally the song explodes into an epic conclusion. The Way Out is a standard straight-forward rocker that adds guitar layers to the second verse to keep the track building up, and it also includes the EP's title lyric. Rival GT is also on the heavier side, and like Aquarium Hovercraft the heavier sections are split between a quiet interlude. I had to listen to it a couple of times to determine its inclusion on the playlist, and in the end it won me over. I'm not really sure what the point is to an EP for a band like the Boston Spaceships where the time between releases is usually very small, or how one track is chosen for an EP and another for an album. I'm guessing it is to create the illusion of a band that follows the more usual release schedule where an EP is a great way to remind people that you are still around and working. 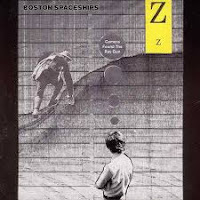 These four songs probably could have fit in with the next album (Our Cubehouse Still Rocks), but either way, they add to the already excellent catalog of music released by the Boston Spaceships. I just want to say keep up the great work, absolutely love this blog! Excellent article because i like the way of writing and presenting.Rarely the readers will get this type of genuine article.I am very happy to see this type article.You can share any informative article with best essay service. I agree, another essential EP with no weak tracks. All on my list. In an attempt to create the ultimate Robert Pollard playlist, I (The Rock Robot) go through all related releases (Guided By Voices/Robert Pollard solo/etc. ), and reviews each item. I hope that new fans of GBV/Robert Pollard will find this a handy guide. This project was started on Dec.12,2005 and should go on until all Robert Pollard releases are covered.